On Descartes’ Passive Thought is the culmination of a life-long reflection on the philosophy of Descartes by one of the most important living French philosophers. In it, Jean-Luc Marion examines anew some of the questions left unresolved in his previous books about Descartes, with a particular focus on Descartes’s theory of morals and the passions. Descartes has long been associated with mind-body dualism, but Marion argues here that this is a historical misattribution, popularized by Malebranche and popular ever since both within the academy and with the general public. Actually, Marion shows, Descartes held a holistic conception of body and mind. He called it the meum corpus, a passive mode of thinking, which implies far more than just pure mind—rather, it signifies a mind directly connected to the body: the human being that I am. Understood in this new light, the Descartes Marion uncovers through close readings of works such as Passions of the Soul resists prominent criticisms leveled at him by twentieth-century figures like Husserl and Heidegger, and even anticipates the non-dualistic, phenomenological concepts of human being discussed today. This is a momentous book that no serious historian of philosophy will be able to ignore. "This is the first English translation of Marion's Sur la pensée passive de Descartes (2013), which is the culmination of his scholarship on René Descartes. In it, Marion develops a radical reinterpretation of Cartesian metaphysics. He argues that in his Meditations on First Philosophy, Descartes quietly distinguishes between extended bodies as understood rationally and quantitatively and the “my body” of immediate sensation. This “my body,” distinct from the rational ego and yet inseparable from it, underlies the mysterious “mind-body union” that Descartes discusses in correspondence with Elisabeth of Bohemia. The “my body” (contends Marion) manifests a nonrational “passive thought” that reframes the relationship between mind and physical world, giving reason to abandon the received interpretation of Descartes as substance metaphysician and dualist. Marion deploys this new interpretive framework to analyze Descartes’s account of the will in The Passions of the Soul. Marion at times seems bent on retroactively recasting Descartes as a phenomenologist of embodiment, but this study is of undeniable value for its painstaking textual analysis and provocative argument. Highly recommended." Marion’s central hypothesis is that the history of the reception of Descartes’s philosophy is based on the occultation of what Marion calls “Descartes’ profound speculative intention” (p. 21), which primarily consists in the elaboration of a nondualistic picture of mind-body union. For Marion, such a “profound speculative intention” has eluded the grasp of the succession of readers and interpreters of Descartes. However, this misinterpretation is the responsibility not only of Descartes’s interlocutors but of Descartes himself. . . .Marion concludes that Descartes anticipated Heidegger. "Descartes taught us that I think therefore I exist. But it is less well known that when that thought is a sensation—a pain, the taste of a pineapple, the vision of a face—he also taught us that it implies that we are united with an organic body. And so, one might say, I think therefore my body exists. In this characteristically elegant and insightful book, Marion draws out some of the consequences of this observation for understanding Descartes’ philosophy, radically transforming our understanding of what Cartesian dualism means." 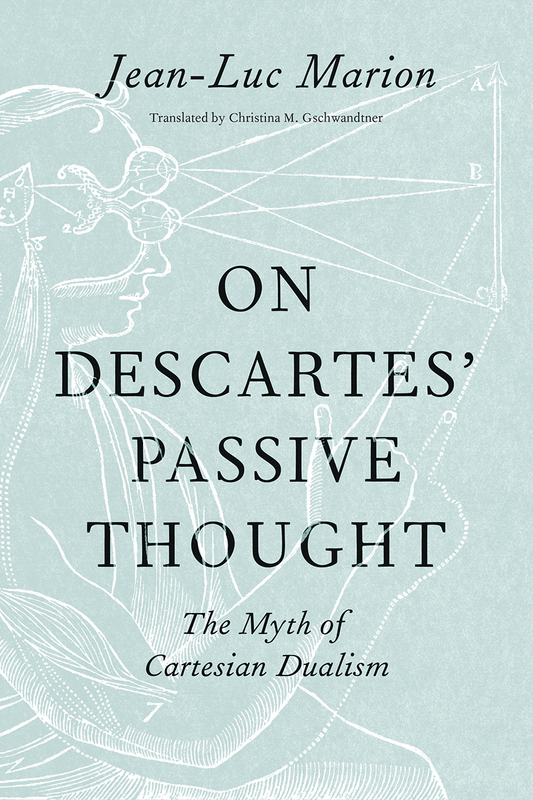 "On Descartes’ Passive Thought is the crowning achievement of Jean-Luc Marion’s historic work, spanning five decades, on Cartesian philosophy. Marion’s remarkable creativity and unparalleled erudition are here on full display while he advances a novel and provocative argument: for Descartes, as for us, passivity is perhaps the most privileged mode of thinking. This book is not only a novel interpretation of Descartes. It is required reading for anyone interested in contemporary philosophical debates concerning affectivity and embodied ways of thinking."